Lotte Chemical is one of the leaders of Asia’s petrochemical industry. It manufactures olefins, ethylene, functional resins and chemicals. Founded in 1976 as Honam Petrochemical with inherited technologies from Mitsui Petrochemical and UK Shell, Lotte Chemical has successfully employed a number of strategic maneuvers to advance itself in the world. Its acquisitions of PTA in Pakistan in 2009, Artenius in the UK in 2010 and Titan Chemical Company, enabled it to tighten its grip on the international petrochemical marketplace. Lotte Chemical made its first appearance on the Korean Stock Exchange in 1991. Lotte Chemical’s mission is to improve the quality of life and the balance of nature in the world. To this end, it has invested considerable sums in product development and green manufacturing practices. A chemical research facility in Daejeon is developing new petrochemical products to keep Lotte at the head of global chemical companies. Its chief competitors in the petrochemicals marketplace are Exxon Mobil Corporation, Hanwha Total Petrochemical Co, Ltd and OCI Company, Ltd.
Lotte’s corporate headquarters is in Seoul, Korea. Six more facilities are located throughout Korea: Daesan, Daegu, Daejeon, Ulsan, Yeosu, and Busan. The Research Institute is located in Daejeon. Lotte’s overseas branches are located in Hong Kong, USA, Indonesia, Malaysia, Pakistan, the UK and Russia. More than 4,500 employees work at Lotte Chemical facilities. In 2013, Lotte began a joint venture with US based Axiall Corporation to construct an ethane cracker facility in Louisiana, which, when operational, is predicted to produce more than one million metric tons of ethylene annually. Its startup date is 2018. 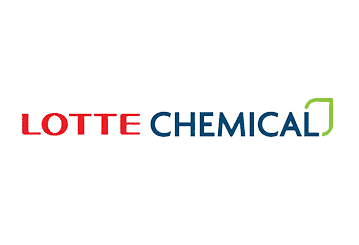 The Louisiana facility will bring to four the number of Lotte Chemical crackers in operation, as it owns three cracker facilities in Asia, that produce 2.8 million tons of ethylene annually. Lotte Chemical’s products are found in every facet of life, from the private home to the aeronautics industry and are sold in 152 countries. It is principally engaged in the manufacture of resin products used to produce polypropylene, polyethylene, functional resin, polycarbonate, and polyethylene terephthalate. Its basic petrochemical products include: mono ethylene, di ethylene, ethylene oxide, tri ethylene glycol, butadiene, Samarium. Toluene, mixed xylene, and benzene top its chemical product offerings. • Polyethylene: HDPE (high density) used to produce chemical containers, fuel tanks, agricultural and industrial packaging and electrical insulation. • LDPE (low density) used to produce flexible containers and packaging, tarpaulin and paper coating, lamination and automobile interiors. • Linear low density used to produce housewares, containers, water tanks, general purpose film, agricultural mulching film, adhesives, laminates and housewares. • EVA (Ethylene Vinyl Acetate Copolymer) used to produce hot melt adhesives, wire and cable, solar cell encapsulants, shoe soles, and electrical wire insulation. The Daejeon Research Institute was established at the Yeosu plant in 1986. Significant research has focused on developing functional materials, polyolefin resins, as well as chemical research into monomers, water treatment technologies, energy storage, feedstock, biochemical engineering, and product to lessen dependence on fossil fuels. The Research Institute developed Korea’s first polymer fuel tank and hot-water Ondel pipe for automobiles. Lotte Chemical is focused on social, economic and environmental stewardship. Through its research and development efforts, Lotte Chemical is bringing to market advanced petrochemical technologies, clean manufacturing processes, and environmentally friendly products that will improve the quality of life for residents around the globe.